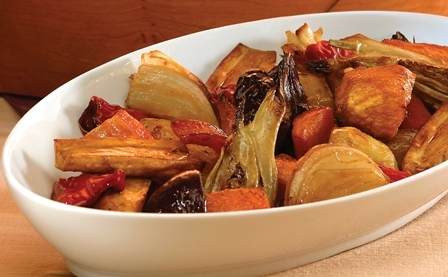 Place cut vegetables in large shallow roasting pan or casserole. In small bowl, whisk oil and vinegar. Pour over vegetables and toss to coat evenly. Season to taste with salt and pepper. Roast 15 minutes then stir vegetables. Roast 15 minutes longer and stir again. Roast another 10 minutes. Check for seasoning. Serve hot.